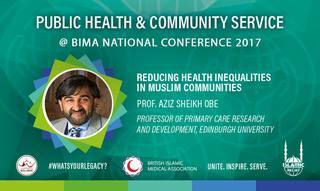 Professor Aziz Sheikh OBE will be a keynote speaker at the BIMA National Conference 2017. 1. BIMA London hosted a string of events last month, tackling taboo subjects in the 3rd annual RUMS medical conference (Life Behind A Label), addressing the issue of mental health in the Muslim community (Undermind), and bringing together several Muslim doctors to speak about juggling faith, family and a medical career (Striving for Excellence). The GPC have launched a consultation on religion, personal values and beliefs in delivering person-centred care in pharmacy. The consultation concerns wording on personal values and beliefs in the new standards for pharmacy professionals, due to come into effect later this year. Firstly this month, a study published in the Journal of Religion and Health investigated the effect of listening to Qur’anic recitation on depressive symptoms in haemodialysis patients in Iran. The authors found that listening to the Qur’an being recited had a soothing effect in Muslim patients similar to the widely used music therapy, which subsequently reduced depressive symptoms calculated using the Beck Depression Inventory-II assessment tool.